Tigre's refusal to play the second half of the Copa Sudamericana final's second leg after accusing police of pointing a gun at its goalkeeper and attacking the players in the dressing room during halftime resulted in Sao Paulo being awarded the trophy. With Sao Paulo leading 2-0 at home, there was a scuffle at the end of the first half in which the police intervened (video below). From there, the Argentines say the cops made things worse by attacking them. "They pulled two guns on us, the rest of the match is not going to be played," Tigre coach Nestor Gorosito told Fox Sports. "They ambushed us and one of them pulled out a revolver and put it against (goalkeeper) Damian Albin's chest. Their security and police also hit us, there were around 20 of them." 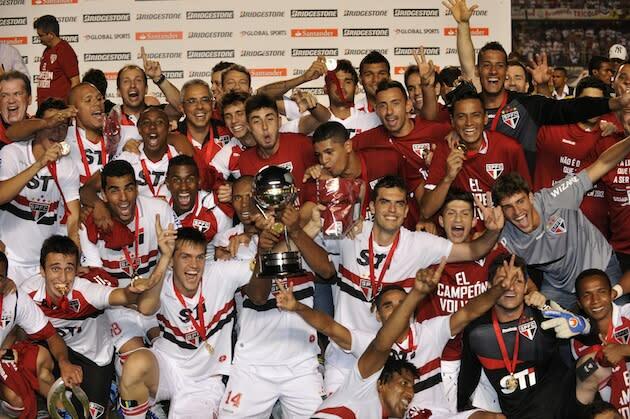 After Tigre failed to reemerge for the second half, Sao Paulo were declared winners and handed the trophy. Tensions rose even before kick-off after officials tried to stop Tigre from warming up on the pitch, though players managed to dodge them by leaping over advertising hoardings. The first leg ended 0-0 following an early red card for each side, so tensions were running high then as well. It seems likely that Tigre will challenge this result once it's back on safer turf. But making the whole situation even stranger is the fact that it was Lucas' final match with Sao Paulo before leaving for PSG in January. He scored the match's first goal.